‘No Through Road’ bootlegged in Bali! Nakatomi’s violent feature ‘No Through Road’ has made its Bali bootleg debut. The copy was found by none other than MUFF award winner and star Megan Palinkas as she was holidaying earlier this year. The DVD was selling for the rather competitive price of $1 along side Hollywood blockbusters. The cluttered cover features such welcome absurdities as “Festival De Cannes – Best Director” and the claim of “The Best Picture Sound and Interactivity”…whatever that means. The credits on the back feature a range of big names and I’m not referring to their profile or talent…I simply mean BIG names; Original Music, John Van Tongeren for example. We the filmmakers are delighted at the thought of Bali holiday makers returning with their stack of bootleg DVDs and maybe giving NTR a spin. If anyone has any other strange NTR sightings then let us know and we’ll publish them. 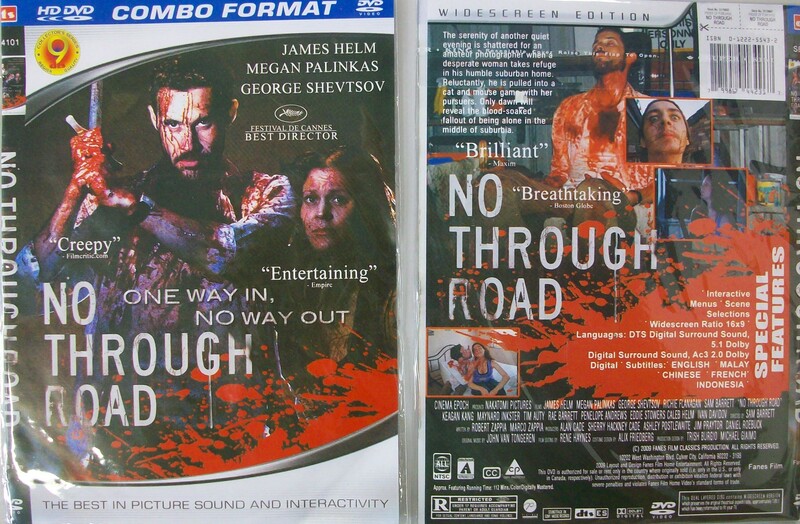 Pre-order ‘No Through Road’ on DVD now! Go to www.ezydvd.com.au and pre-order your copy of the Nakatomi Pictures feature: NO THROUGH ROAD.